Skeptical Scalpel: "Hospitals stumble in preventing harmful 'never events'"
"Hospitals stumble in preventing harmful 'never events'"
A recent story in the AMA's American Medical News (amednews.com) was headlined "Hospitals stumble in preventing 'never events.'" It reported that the Minnesota Department of Health said, "the number of patient disabilities attributed to the mistakes rose from 84 to 89, while related patient deaths jumped from five in 2011 to 14 in 2012." Here’s a chart from that Minnesota DOH report. Deaths are in red and disabilities (harms) are in blue. What do you think? Have the hospitals really stumbled? The report consists of all of the patient harms and deaths voluntarily reported to the state by hospitals for the years in question. It is well-known that voluntary reporting captures less than 10% of all adverse patient events. Minnesota has about 150 hospitals. Here are some numbers for the last reporting year (10/11-10/12). Do you believe those numbers? I don’t. The number of pressure ulcers declined by 8%. This is the first decline of this magnitude in the nine years of reporting. This year’s total of 130 is down from an all-time high of 141 last year. If you’re a skeptic, you might just question that figure as it means that the incidence of pressure ulcers averages less than 1 per hospital per year. Retained foreign objects declined by 16 percent, the first drop in this category in five years. 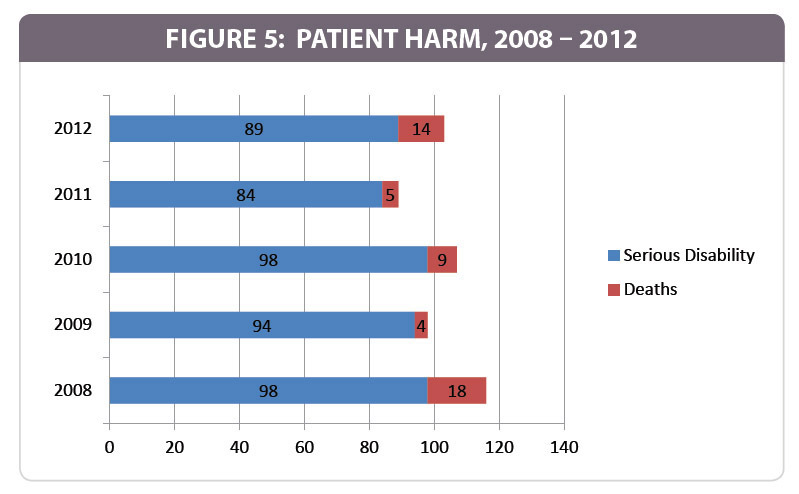 Medication errors dropped by 75% from the previous year and were at the lowest level in all nine years of reporting. Now here's the real problem with the report and the amednews.com story. Here are charts of the deaths and harms without the annoying 3-D bars, but with trend lines clearly showing that if anything, the trend is that both harms and deaths are decreasing, albeit not significantly. They certainly aren’t getting worse. As I have written many times, a bit of knowledge about statistics can be quite useful if you are doing research or reporting on it. So yes, "hospitals stumble" but maybe not in preventing "never events." The stumble is in the reporting of "never events" by hospitals. I think amednews.com stumbled there too. I agree that the 'stumble' appears to be in honest reporting (and maybe also in less than optimal prevention). I want to add that since the National Quality Forum created its original Never Events list in 2002,the list has grown to includes 29 'events' in 6 categories. From the AHRQ website: "Since February 2009, CMS has not paid for any costs associated with wrong-site surgeries." I doubt this is a huge cost savings,since it happens infrequently. Here is one to think about; I heard a summary on NPR of the JAMA April article about a hospital actually making more money on pts who had complications after surgery; "If a patient with private insurance had complications after surgery, hospitals made $39,017 more profit than if all had gone well. That's compared to an additional profit of $1,749 for a Medicare patient with complications after surgery." So preventing complications was actually un-profitable? Go figure. That study about hospitals making money from complications is all over the Internet now. Some articles about it seem to imply that surgeons deliberately create complications so that hospitals can profit. Nonsense. Good luck convincing the general public about that. Can't get the stray horse back into the stable too easily. it is well-documented that 90% of never events such as pressure ulcers are under-reported. Tens of thousands of wound assessments per month on our point-of-care electronic platform confirm that the "official" reported numbers on facility-acquired pressure ulcers are hogwash. Gaming the system is not so easy when you are not charting wounds on paper. rhett, I agree. One wonders why the DOH in Minnesota doesn't audit a few hospitals. The real numbers would soon be apparent. EECP, I'm sorry but I don't understand the question. This post isn't about one hospital. It's about all the hospitals in Minnesota. If you click on the link in the second paragraph, you can read the report yourself. There is information about each hospital in that report.